This was my fourth visit to the Staten Island Zoo since my friend Marc Valitutto became the the General Curator and Veterinarian. Once again, Marc gave us a fabulous tour and showed us the amazing changes he has made in this 75 year old zoo. The collection has jumped from 750 to over 1500 animals and continues to grow. We met the zoo’s newest adorable female baby binturong, (who smells just like popcorn) plus got to greet the sweetest baby Tamandua and Mom. Their new Amur Leopard exhibit is now open and at 4,500 square feet makes for a great visitor experience. The cats are active and very close. A shout out to Marc for his generosity and continuing great work. The Staten Island Zoo, which proudly calls itself ‘New York’s Biggest Little Zoo’ is a great place to visit. We went via the Staten Island Ferry which in and of itself is a great adventure. We ARE GOING! 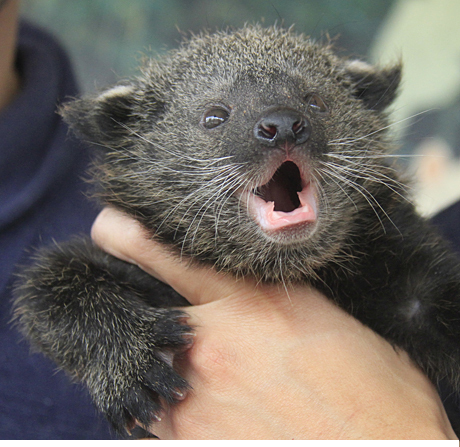 As if the words Baby Binturong aren’t enough, you had to add they smell like POPCORN! Yer killin me!!! Good PR for the zoo and SI. Having a great time in Portland. Will fill you in when we can speak. Glad the girls are doing fine- they are so damn cute, as is Benny. And you, of course. Madison is Madison. Once again, amazing photos! Thanks! Great photos! Did you get a new camera — the resolution seems to be higher. Oh wait, maybe it’s my new reading glasses? Every time you post about a visit to the Staten Island Zoo you make me want to go that much more! I love your photos of the binturong – they are simple ADORABLE! Thanks so much – look for more cuteness tomorrow.